One of the most basic skills in astronomy is know how to find objects in the night sky. That means you need a way to navigate the sky. The simplest way is known as altitude and azimuth. Starting at due north, rotate clockwise along the horizon until you are directly under the star you want, then move above the horizon to reach your star. It is a simple coordinate system, since it is just so many degrees clockwise (azimuth) and so many degrees upward (altitude). The downside of this coordinate system is that the Earth’s rotation means the positions of the stars are constantly changing relative to your position. This means a star’s altitude and azimuth change moment by moment. For this reason, astronomers often use a different coordinate system, known as declination and right ascension. This system is based upon the latitude and longitude of Earth. If you extend the equator outward to the sky, it traces a celestial equator. Extending the Earth’s rotational axis into the sky gives the north and south celestial poles. Tracing angles from the celestial equator to the celestial poles gives you the declination, just as it would give you your latitude on Earth. The celestial longitude is known as right ascension, and instead of being measured in degrees it is measured in hours (24) minutes and seconds. This is to account for the rotation of the Earth. The movement of the stars can be used as a measurement of time, known as sidereal time. Declination and right ascension have the advantage that they don’t change moment by moment for a particular star. If your telescope is mounted to align with declination and right ascension, then you only need to account for the sidereal time to track a star. Of course the Earth not only rotates, it also precesses (wobbles slightly) over the years, so orientation of these coordinates do slowly change over time. 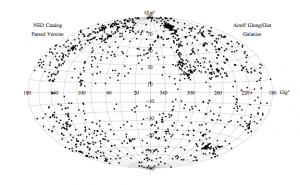 For this reason astronomers usually pick a standard date to fix the coordinates. The most popular is known as J2000, which defines 1 January 2000 at noon as the standard. 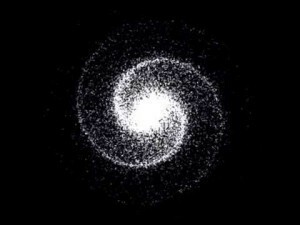 While this system is useful for the positions of stars and other objects in our local neighborhood, it isn’t as useful for locating objects on a cosmic scale. For this we use the galactic coordinate system seen above. 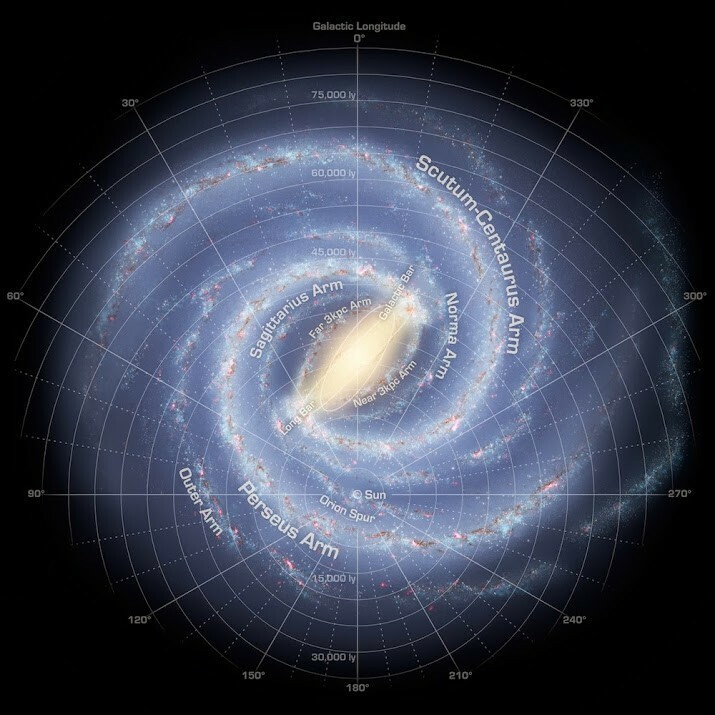 For this coordinate, the “equator” is defined as the plane of the Milky Way, with zero degrees longitude defined as the direction of galactic center. The Sun is the center of this coordinate system. In each of these coordinate systems we are the center of the universe, whether it is us personally, the center of the Earth, or the location of our Sun. Of course that makes sense, since the only view of the universe we have is ours. Brian, I appreciate what you are giving us on your blog. Please continue. This is so simple! NOW I get it! Thanks man. One question, is the right ascension measured in local geographic time? For instance if I have dec= 46 deg and an RA= 4hrs 28mins does that approximate 4hrs28mins after “rise”? Right ascension is measured from the Vernal Equinox, where the ecliptic meets the celestial equator. There’s a similar problem in computer games, specifically ones that ‘simulate’ space travel, where the vastness of space and the limitation of numerical precision, results in lots of unrealistic compromises for designers of these games. The first is that you need to use different scales, reference frames and coordinate systems for each tier of space: inter-galactic, inter-stellar, planetary, atmospheric travel, and walking about. It often results in a discontinuity when transitioning between them. The other is that games tend to have a ‘blink and you’re there’ design, where the intermediate space is edited out (it’s likely to be boring anyway: just waiting). That also conveniently allows a designer to forget about the need to match the momentum when arriving in those frames. They might also forget that objects are moving relative to each other. Realistic simply wouldn’t be fun.